Before Cal-Access, anyone curious about who was giving money to politicians had to make a trip to the Secretary of State’s office to dig through the paper contribution reports by hand. That’s okay for reporters with time on their hands, no good for anyone with a real job. Cal-Access presented the first opportunity for ordinary citizens to hop online and access finance records electronically, to find out who was trying to influence their elected representatives with campaign cash. California was the first state to provide that kind of access. “Basic searches like how much money does Comcast give to legislators could not be done without downloading hundreds of files.” — Dan Newman. Fast forward 15 years: What was once cutting edge is now obsolete. “The current system is broken, literally,” says Lapsley, now president of the California Business Roundtable. In April, the system went dark for several hours right before a major campaign finance deadline. It was one of many frequent breakdowns. A few years back, Cal-Access was out for three weeks. It’s a mismatched, patched-over system, running on a dozen different programming languages, some no longer learned, and in need of a complete overhaul. “The whole system predates Myspace, it predates USB flash drives,” said Daniel G. Newman, president of the Berkeley-based non-profit MapLight. Besides being unreliable, the system is awkward and frustrating to use. Finding campaign contributions to a single candidate may require multiple searches under different committee names and different years. There are separate search fields for contributions received and “late” contributions received. There are separate fields for contributions received below $5,000 and contributions above $5,000. The data generated by each of these separate searches can be downloaded into separate spreadsheets. If you’re reasonably proficient at Excel, you can merge those spreadsheet yourself. Otherwise, good luck keeping the information organized. There have been some improvements recently. Last year MapLight launched an open source program called Power Search, linked to the Secretary of State’s website, which makes it considerably easier to search, sort and download data. But Newman says it’s a temporary solution, and doesn’t solve the underlying problem of Cal-Access’ fragile infrastructure. In the 2014 election campaign to replace the termed-out Bowen, all of the major candidates promised an overhaul of the decrepit system. MapLight built Power Search using the raw data feed from the Secretary of State’s office. But when the group first asked then Secretary of State Debra Bowen for the data, she initially refused, saying the information was available on CD-ROM for $5 a disc. Bowen only agreed to share the data after complaints from open-government advocates. So it has gone. “We always thought the next Secretary of State coming in would improve on Cal-Access,” said Lapsley, whose former boss, Secretary of State Bill Jones, first launched the system. But Jones’ successor, Kevin Shelley, lasted just two years in office before he was driven out by scandal. His appointed replacement, Bruce McPherson, was also in the seat only a short time, before being defeated in his 2006 re-election bid by Debra Bowen. She spent eight years in the job, but because of the recession, state budget cuts, and possibly because of her own health problems, she struggled to move the office forward. In the 2014 election campaign to replace the termed-out Bowen, all of the major candidates promised an overhaul of the decrepit system. So it falls to the new Secretary of State Alex Padilla, who has finally begun the lengthy process of replacing Cal-Access. Total replacement is estimated to cost $13.5 million. Under the Secretary of State’s current timeline, a request-for-proposals is expected to be issued in summer of 2017 for would-be contractors. Right now the Secretary of State estimates the new system would in place in time for the 2020 presidential election. Hertzberg’s bill doesn’t provide the money to build a new Cal-Access system. Most of the funding will have to come later. But a coalition of open-government, labor and business groups are backing legislation — introduced by Senator Bob Hertzberg — that they hope will speed up the process, and spell out certain requirements for the new system. Newman envisions a portal that would allow voters to put in their address and learn what candidates are running in their area, along with the top contributors in those races. Others point to the campaign disclosure system used by Washington state as a possible model. The Washington Public Disclosure Commission website makes it easy to slice and dice and explore campaign finance information with a user-friendly interface. Users look up a candidate’s name and then can start sorting contributions by name of donor, employer, ZIP code, city, or other fields. The site allows users to search state and local offices, and also to access information about enforcement actions against violations of campaign finance rules. 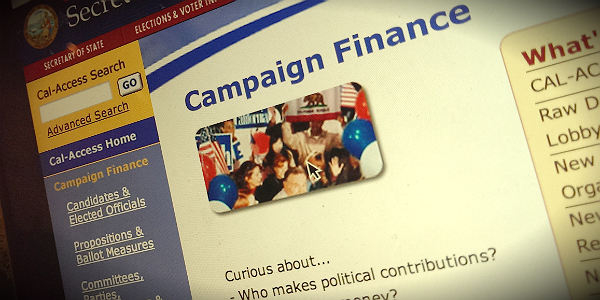 California may also be able to provide near-instant posting of all campaign donations. “I’d like to see every contribution above a certain amount disclosed within the next business day,” said Newman. While contributions made near to election day currently must be disclosed within 24 hours, most campaign contributions are only reported every quarter. “There’s no need for that in the modern era,” said Newman. Mayer says campaign finance reform is a three-legged stool. One leg is campaign contribution limits, which the courts have been hostile to. Then there’s potential for public financing of campaigns, which is politically difficult. Finally, there’s disclosure. But even if California lawmakers wanted to pursue stronger disclosure laws, the Cal Access system likely couldn’t accommodate them. “If the best tool we have is transparency, we need to at least have current technology,” said Mayer.